Christian Rösemeier, CEO of Energy-Office q50 and his team are riding on a huge wave of success. Everything began with lots of wind at the new stock of the popular mail-order company Zalando in Erfurt, Germany. Rösemeier got the mission to realize a Blower Door Test there. 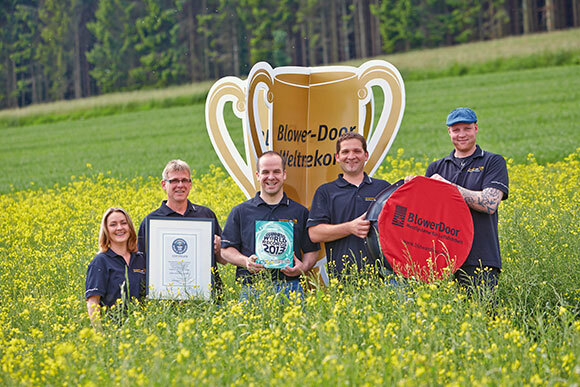 At the same time he registered this Blower Door Test at the office of Guinness World Records in London. Recently the certificate arrived at the Energy-Office q50 in Germany. Guess what! 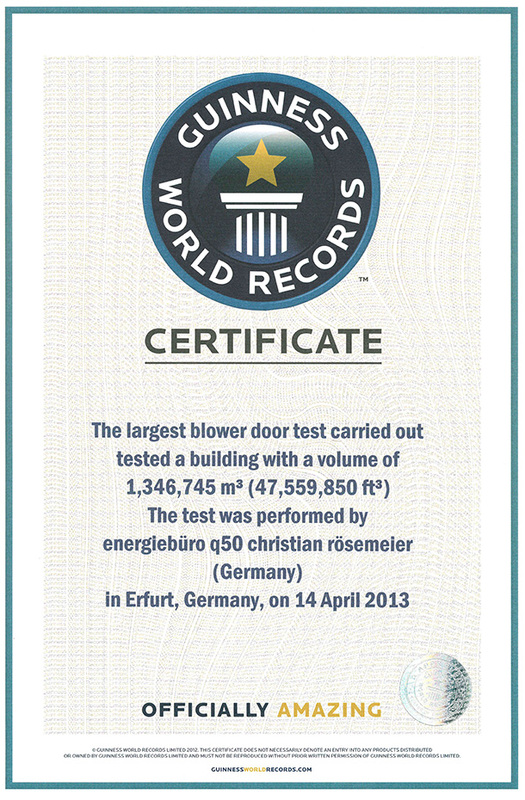 Christian Rösemeier and his team have accomplished the biggest Blower Door Test of all times. How it came about: The team spent three hours to build up the equipment. The Hard- and Software needed to be built and furnished. Over 30 Minneapolis-blowers had to be installed into the outer doors of the 101,400-square-foot building. A 40-horsepower gasoline-engine was in use. CEO Rösemeier has imported it from overseas. By the way: It is the biggest blower in Germany. Only nine hours from planned twelve hours were necessary for the Blower Door Test. Thanks to the well coordinated team of q50. And: Only 217.000 of 400.000 cubic meters total volume flow per hour were needed. „We have had a great process. Everything went according to plan – and even better“, says Christian Rösemeier just after the spectacular Blower Door Test in Erfurt, Germany. Ralf Sihler from Sihler GmbH and Marcos Rojo from BlowerDoor GmbH have checked the record according to the standard DIN EN 13829th. At home in Hessisch Oldendorf, Lower Saxony, the results of the Blower Door Test were exactly analyzed and evaluated. Not only for the investor Goodman Cinnamon/Boysenberry Logistics (Lux) S.a.r.l., also for the Office of Guinness World Records in London. After a few weeks of waiting, Christian Rösemeier could keep the certificate in his hands. „It´s a good feeling. I´m very proud of my team“, says the CEO of Energy-Office q50. Together with Sandra Tesche, Nils Oppenhausen, Andreas Meier und Tomas Lemos, Rösemeier is looking forward into the future expactantly. The know-how, the use of modern technology, reliability and the ability of the Energy- Office q50, has already spread around the world. "Technician Nils Oppenhausen currently checks the casing of a steam turbine at a power plant in EL Sauz (Mexico). 2013 is a positive year for us and we get a few new orders", says the engineer. Rösemeier and his team are experts in the fields of leak detection by thermography and Blower Door, in the TGA planning and building physics. Whether logistics centers, manufacturing or frozen halls, office buildings, shopping centers, residential or public buildings, the energy office q50 plans, organizes and accomplishes. It never has been so important to save energy in order to conserve the environment, climate and budget. Therefore, investors and builders of any kind should put on the right partner. For information: Christian Rösemeier offers workshops for specialists. The courses and tutorials at the e.u.z Academy deals with subject areas like Blower Door Tests and building thermography at the highest level. 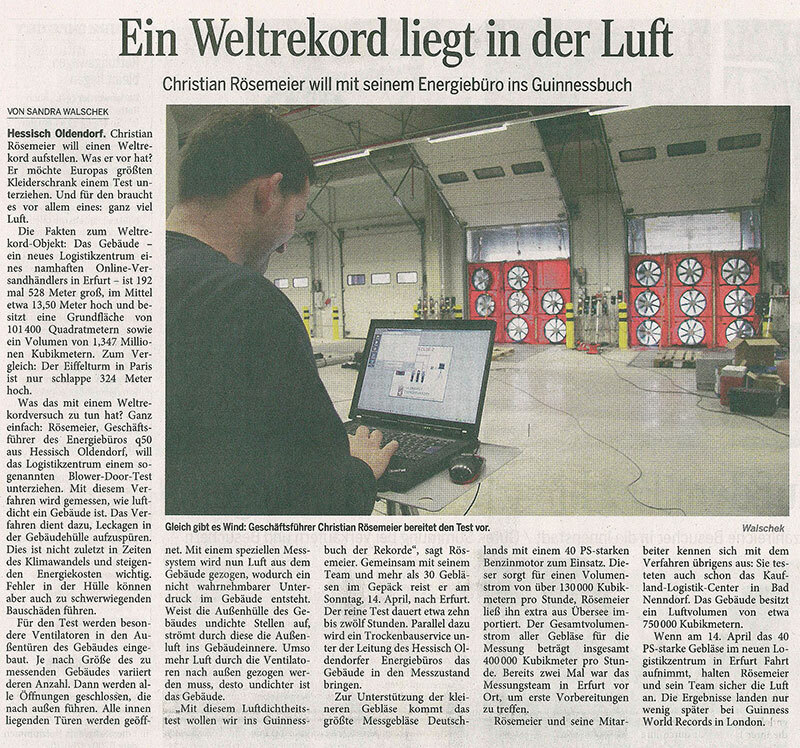 Just four weeks ago, CEO Christian Rösemeier and his team from Office of Energy q50 were traveling to Erfurt (Germany). Europeans biggest closet was waiting there for a Blower Door Test. 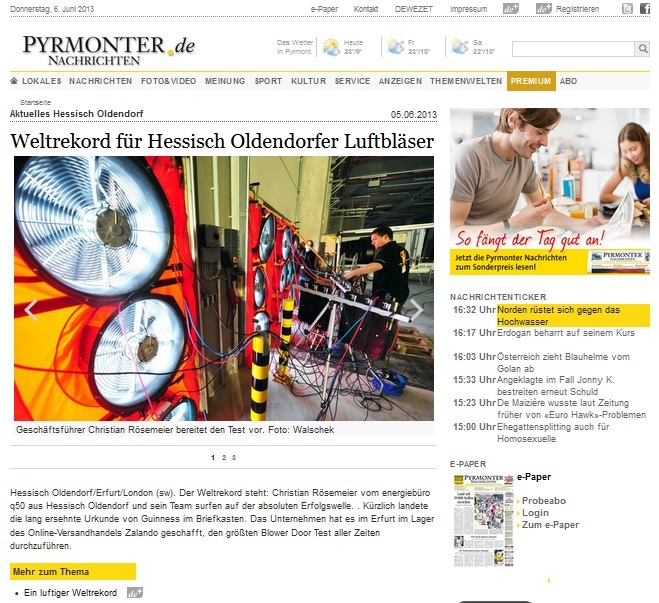 „World Record is in the air“ and „World Record is virtually certain“ titled the local press in Hameln-Pyrmont, Germany. The results are at the office of World Records in London at the moment. The Office of Energy q50 has to wait for its release. But Christian Rösemeier is in an positive mood. The work of his team of experts should be the biggest Blower Door Test in history. 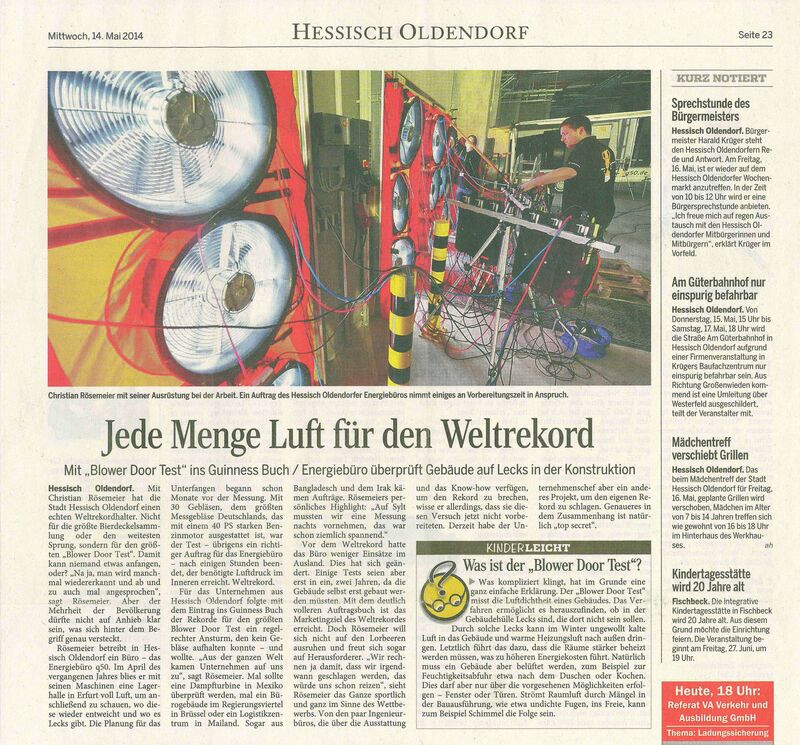 Something like „Trust to getting an entry in Guinness Book of World Records“ was a headline at the local press in Erfurt, too. A team of six special engineers and technicians is working european-wide. The Office of Energy q50 has tested the air-proofness of many logistic-centers for well-known groups. Next to Blower Door Tests, the Office of Energy q50 is specialized in structural physics. Christian Rösemeier is developing reclamation concepts for his costumers. Energy consulting (BAFA guideline), applying for subsidies, construction monitoring is following until final acceptance. Strategy of building services is one-stop, too. By the way: The Office of Energy q50 is offering seminars in Blower Door Tests and thermography for buildings. Energy saving is a big matter for entrepreneurs as for private owners. Blower Door Tests are an important tool. Good to have experts like Office of Energy q50, seeking even a new World Record for climate protection. Clench your fist for victory: Since Sunday the 14th of April, Christian Rösemeier and his team are aspirants for a new world record. 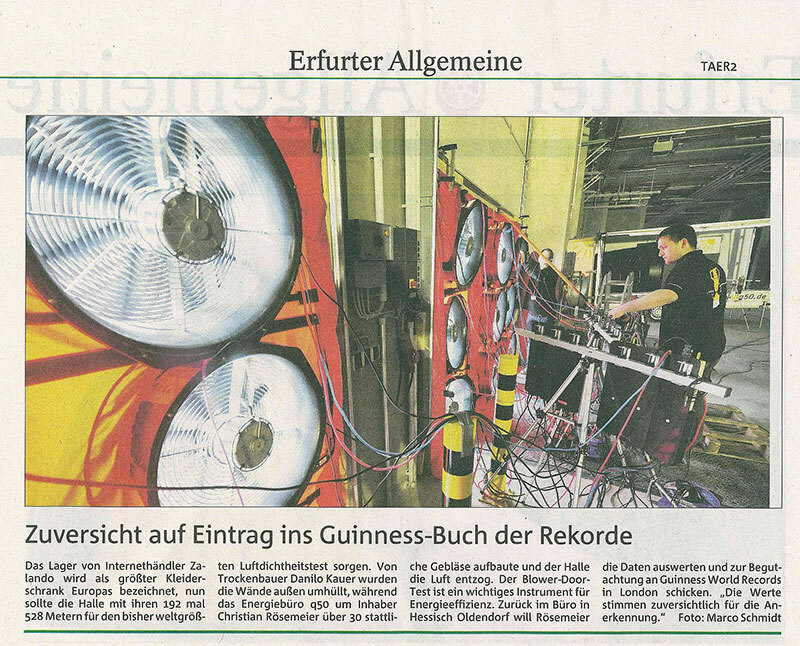 Reason is the Blower Door Test at the stock of mail order company Zalando in Erfurt (Germany). With this Air-Tightness-Test the office of energy q50 is on its way straight to the Guinness Book of World Records. 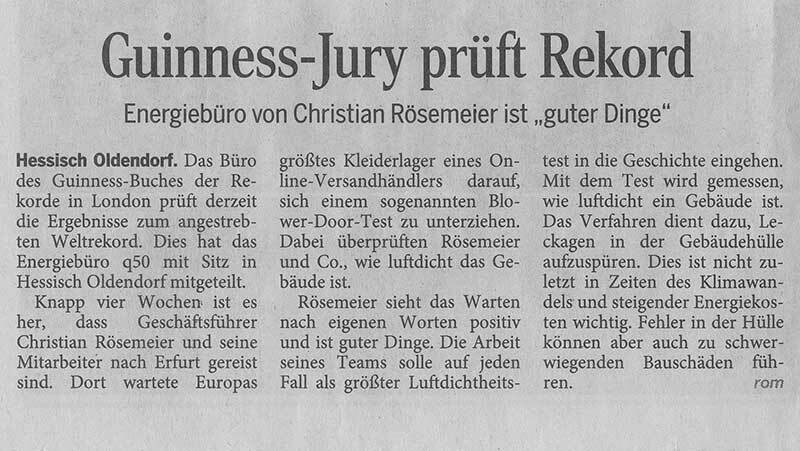 „Due to a good prearrangement and an awesome team, we had a great process of mensuration“, says Christian Rösemeier. Just nine hours had been necessary for the Blower Door Test of the 101.400 square meters building area. Three hours less than calculated. Only half of the complete volume flow were used: circa 217.000 cubic meters of an available complete volume flow of 400.000 cubic meters per hour. The absolute installation tooks three hours. Ventilators were built into exterior doors. All openings which are conducting to the outside, were closed. All internal doors were open. By using the ventilators, (Blower Door) air is getting extracted out of the building through an indiscernible vaccum. „The building still could have been bigger“, says Rösemeier. By the way: In use was the biggest ventilator of Germany: a gas engine with 40 PS. Christian Rösemeier imported it from the United States. Existing leaks were analized with an infrared camera and a thermoanemometer. Blower Door Tests are Rösemeiers staff of life. The office of energy q50 is working all over Germany and partially EU-wide. For a german costumer, Christian Rösemeier was also in Olomouc in Czech Republic to gauge a deep-freeze logistic-center. Business concerns and private owners ensure themselves against fatal damages in their building area with Blower Door Tests. In times of Climate Change and rising energy costs, air-proofness is an important criterion for all new buildings and rehabilitations. “Now it´s time for analyzing”, says CEO Christian Rösemeier. On Monday he was on his way from Erfurt back to his hometown Hessisch Oldendorf (Hamelin, Germany). The results should be at the office of Guinness World Records in London at the end of the week. Until then, the team will be tremble since the message of deliverance is coming: Blower Door Test-World Record is accepted. The office of energy q50 gets its expected entry into the book. Europeans biggest closet is coming under scrutiny: Christian Rösemeier, CEO of „energiebüro q50 Rösemeier“ (office for energy) is currently planning the biggest Blower Door Test of all times. 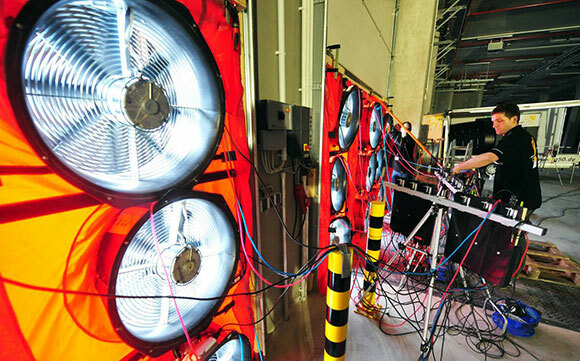 The Expert-Team for energy from Lower-Saxony, Germany (Hameln), wanted to set a new world-record with a Blower Door Test at the stock of a popular mail order company in Erfurt. Facts: The building measures 192 times 528 meters, has a base area of 101.400 square meters, is 13,5 meters high and has a volume of 1.346.800 cubic meters. 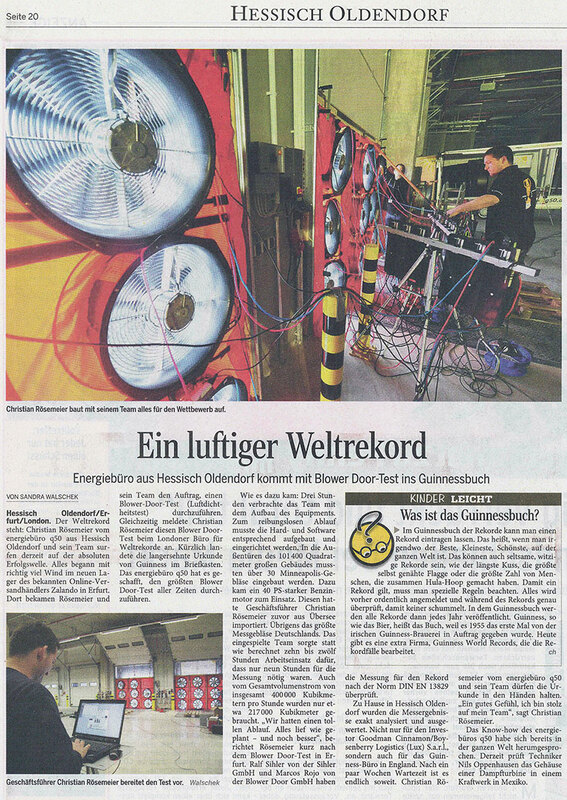 A big deal - not only for the Investor Goodman Cinnamon/Boysenberry Logistics (Lux) S.a.r.l.. “With this Blower Door Test we want to get an entry in the Guinness Book of World Records”, says Christian Rösemeier. 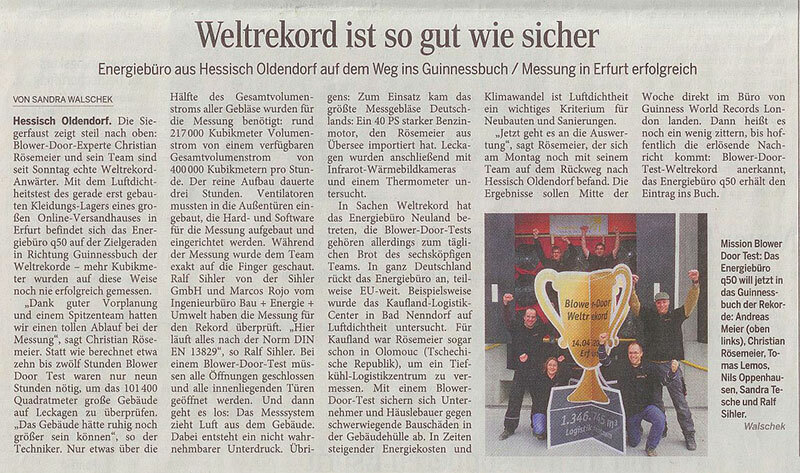 On Sunday the 14th April he and his team are travelling with more than 30 Blower Dower compressors to Erfurt. The pure test takes ten to twelve hours. Under the direction of “energiebüro q50”, the “Danilo Kauer Trockenbauservice” (Dry Wall Installation) will bring the building into condition of measuring. A big gun, too: Germanys biggest Blower Door compressor with a 40 PS-gas engine from “energiebüro q50”, is going to be used together with the Minneapolis Compressors. Christian Rösemeier has imported the machine from the USA. The compressor has a volume flow rate about more than 130.000 cubic meters per hour. That knocks socks off: the entire volume flow rate of every compressor is at large 400.000 cubic meters per hour. Pre measurements inclusive, the “energiebüro q50” was visiting Erfurt two times to assess the total expenditure and to make first preparations. What about Blower Door Tests? The Blower Door Test is one of the most important instruments for energy efficiency, in times of rising energy costs and climate change. With a Blower Door Test you can measure the airtightness of a building. It serves for detecting leaks in building envelopes and to determine the air exchange rate, in order to eliminate structural damages while the construction phase. The air-impermeability of buildings is stipulated in the Energy Saving Enactment of the German Government, to avert leaks in new buildings. So the Blower Door Test is important for business companys such as for private house owners. No matter if new buildings or rehabilitations. During the Blower Door Test, ventilators will be build into exterior doors. Depending of the building-size, the amount of ventilators is varying. All openings which are conducting to the outside, have to be closed. All internal doors have to be open. By using the ventilators, (Blower Door) air is getting extracted out of the building through an indiscernible vaccum. If the outer shell of the building is permeable, ambient air is pouring into the inside. Depending on the air, which is getting extracted through the outside, the more the building is permeable. Men of action: The “energiebüro q50” is certified for ISO 20807 (air-proofness-testing on buildings) and is licensed to accomplish Blower Door Tests Europe-wide. CEO Christian Rösemeier is certified by the Fachverband für Luftdichtheit e. V. (Professional Association of Air-Tightness) as defined by the Energy Saving Enactment. A six-headed Team is planning, preparing and accomplishing. Even at the weekend or in the night according to costumer requests. Measuring gauges of the new generation are in use Europa-wide as well as subject-specific Hard- and Software. From the order entry to the precise measures and proposals for solutions, the secure and efficient accomplishment is guaranteed. Consulting and service such as application and documentation of the results by “energiebüro q50”are one-stop. Trainings in airtightness, building physics and building equipment strategy are expanding the business activities of “energiebüro q50”. And if the powerful 40-PS compressor is getting started on Sunday, the 14th April, at the stock in Erfurt, Christian Rösemeier and his team will stop breathing for a few seconds. The results of the analyses are landing at the Guinness World Records in London just a little later.